SiC reinforced Al–Mg–Si powders were ball-milled in a mixer device with different milling times. This process was performed to observe the possible effects of different milling times on the final microstructure and properties of the materials. 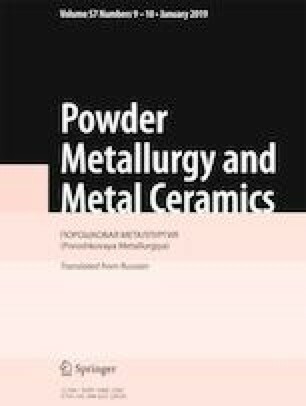 Mechanically alloyed powder mixtures were sintered to produce a billet in protective gas atmosphere (argon). Then, the billets were polished, and the microstructures of the obtained billets by sintering were investigated using a scanning electron microscope (SEM). Powder mixtures were analyzed by X-ray diffraction (XRD) for the investigation of the phases. The crystal sizes of the mixed powders were calculated using XRD peaks with the Scherrer equation. It was found that SiC particles were uniformly distributed in the composite matrix. It has been observed that as the milling time increases, the size of the matrix grains decreases due to decrease in the crystal size. By increasing the milling time, the work hardening of the composite powder particles, hardness and, consequently, brittleness increase. Published in Poroshkova Metallurgiya, Vol. 57, Nos. 11–12 (524), pp. 82–92, 2018. The authors would like to thank Erciyes University for the financial support of the present study (Project no: FYL-2015-6067). H.K. Gusaiwal and S. Pattanaik, Synthesis of Al–Si–Ni nanostrustured materials by mechanical alloying, https://tr.scribd.com/document/328843768/project-hemant-08-05-09-pdf; Accessed 30.03.2018.